Today, I am guided to apply the meanings and numbers that I shared in this post six weeks ago. For ease of reference, here is the schema that I created in which I assigned meanings to the numbers 0 to 9. This, of course, is a personal interpretation, and I do not expect anyone to receive it as gospel truth. Rather, in a spirit of fun, with a view towards realizing divine love and wisdom, I intend to use this schema as a guide for composing future posts from here, ultimate fulfillment 60, through to ultimate fulfillment 99, at which time I would like to flesh out this outline with the writing of a new series of posts, fulfillment outline 1 to 9, after which I intend to expand on selected topics that are relevant to the book I am writing on this subject. 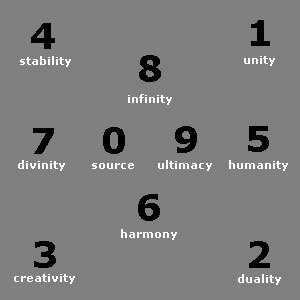 With the source field (0), unity (1), duality (2), creativity (3), stability (4), and humanity (5) as my cosmic context of inquiry, I will explore the nature and meaning of harmony (6), divinity (7), infinity (8), and ultimacy (9) in terms that serve to articulate and illustrate an approach to the ultimate in fulfillment. So let us begin with the number 60. With reference to my schema, I interpret 6-0 as follows: “harmony with the source field”, or “harmony with Source” (or with God, Spirit, the Tao, the One, the Living Universe – however you wish to characterize the universal unity and harmony that underlies the many lawful manifestations of space and time, matter and energy, organicity and sentience, consciousness and awareness). In this light, you might think of my posts, ultimate fulfillment 1 to 59, as attempts to define my approach to realizing the ultimate in personal fulfillment, and subsequent posts, ultimate fulfillment 60 to 99, as attempts to define an approach to realizing the ultimate in fulfillment. The source field seems to appreciate, bless even, novelty and variety in its creations. I am reminded of the extraordinary response I received to my graphical query, which I posed here, and which was answered here. If the living, loving universe is this responsive to my intent, then could it also be responsive to an authentic, sincere, honest, integrous, and genuine wish to be a consultant to Source? Here, I am not speaking merely of being on par with a Source consciousness; I am speaking of having something novel to contribute to the source field – not of entering God Mode, not playing God, but of being Creators in our own right, in positions where we can begin to advise the source field, to have a Source consciousness consult with us, to bring into being a true and wise co-creation that serves the good of one and all. A good place to start with all of this rather heady, lofty stuff is with what is called the Original Wound (or the Wound of Separation), the link between emotional pain and wayward behavior that binds us all, which is the illusion that we have been abandoned (existentially). It is no secret that humanity is deeply wounded. Just listen to the way most people speak; just observe the ways in which most people behave and conduct themselves. It is not a pretty sight. This Wound is a dark place, and I do not recommend that we spend much time there. Having said this, I do recommend that we touch the Wound lightly on occasion to remind us of the work that still needs doing, of the Light that still needs holding, showing, and/or bringing. After all is said and done, humanity, I believe, is still worth saving, its promise and potential still worthy of consideration, not by presuming to be holier-than-thou saviors of humankind, but by placing a wounded humanity in a higher context, to help raise humanity to a level where it can be viewed and treated as worthy and deserving by more advanced species. Viewed in this light, a Source consciousness requires our participation. I honestly do not know how high we need to go. More than likely, we would not need to go as high as 7D Source (the Universal Logos). Perhaps we need only go as high as 4D (the Gaia Logos) or 5D (the Solar Logos) or perhaps 6D (the Galactic Logos). I have heard it said that there are 6D beings who are presently in our solar system, who have quarantined the entire system, who are making a concerted and phenomenal effort with large, cloaked, interconnected spheres to attenuate energies bathing the earth at this time (I am not yet sure if such energies are flowing from the galactic core or from the acceleration of the orbit of our binary solar system as it (yet again) approaches The Lost Sun or The Black Sun after a period of 25,920 years). I am also aware of the thinking behind souls who incarnate as human, as being 12D beings who are presently attempting (on some level) to restore their DNA to its original 12-strand design by having its current 3-strand material manifestation reconnected to its 12-strand energetic substrate by evolving into a 13D level of meta-consciousness. On this notion, we were originally 12D beings who took the plunge into 3D to experience a massive constriction in consciousness (along with its associated amnesia) to challenge us to work our way out of this constriction into greater expansion, to heal the Original Wound created by the initial suffocation, while evolving onward and upward in the process. This would suggest that we are extremely, ridiculously powerful multi-dimensional beings who feel trapped inside a very low density (3D), who may have bitten off more than we can chew, given how collectively challenged we are. 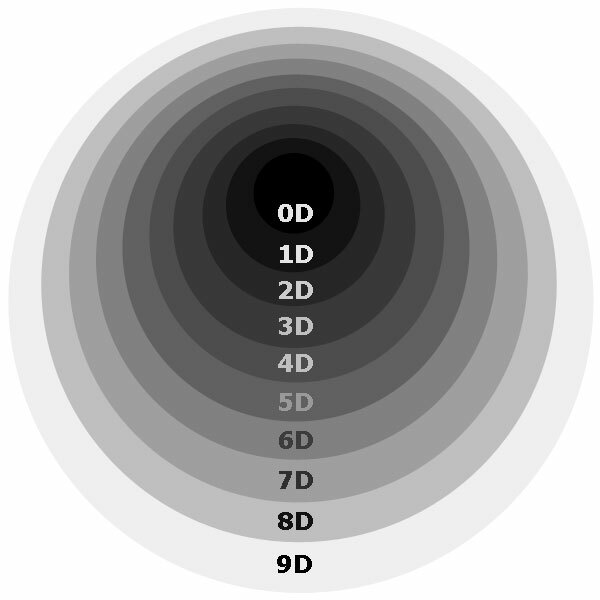 Having said this, I still favor the 9D schema, at least for now (I wouldn’t know where to begin to characterize 10D, 11D, 12D, and 13D levels of consciousness). With a 9D perspective, we would do well to keep these two points of view in mind: (1) light contains the information required to shape matter and energy in space and time to generate biological life (see the Wisdom Teachings of David Wilcock on Gaiam TV); and (b) light has its own point of view, where space and time, matter and energy are non-existent (see the remarkable video below by Peter Russell). Additionally, with respect to light, the essence of a consciousness is to tap the information in light to manifest desired outcomes, and when I say “a consciousness”, I mean your version of consciousness, my version of consciousness made manifest – in fact, anyone blessed with the powers, privileges, and pleasures of a developed, disciplined consciousness. With such a consciousness, access to higher densities is possible with capabilities (capacities and abilities) arising that are commensurate with these densities. So, for example, my version of consciousness made manifest becomes more intuitive the more attuned it becomes to 4D light. So again, harmony with Source consciousness operates on many levels of density. I invite you to take this supposition to heart as I share my views on fulfillment, moving forward, onward, and upward, while keeping in mind the blessings of harmony, divinity, infinity, and ultimacy.